The Potterton Assure 18kW is a system gas boiler. This is condensing and wall mounted. This model has a low lift weight of 28 kg making it an extremely lightweight boiler. This can help you save time and money on installation. It is able to fit in a standard sized cupboard with ease making the unit perfect for the homes where space is limited. 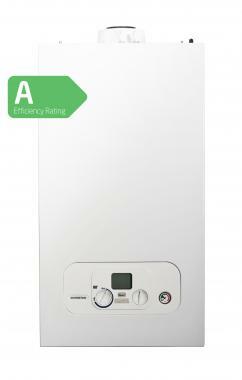 With it being a system boiler it directly heats your central heating system and hot water storage cylinder. Most of the important parts of the hot water and heating system, such as the pump and expansion vessel, are built in on a system boiler making it quicker and cleaner to install. It also means you get a faster response to demand for heating and hot water plus you don't need to have a feed and expansion tank in the loft. This boiler comes with a variety of other features and benefits including front access to all components, central flue for ease of siting, flueing options of up to 20m allowing for greater flexibility of siting, optional outdoor weather sensor available (enhances system control and comfort), no special tools or replacement seals required for standard service, pipes behind facility within boiler casing to save time, built in drip tray which provides protection against water ingress in extreme weather conditions, and vertical packaging which allows for ease of access to all installation accessories from top of the packaging. All these features allow for a highly efficient boiler. It has a high efficiency rating of 93%, making it A rated. As well as this the boiler comes with an output rating of 18kW making it perfect for the smaller homes with only one bathroom and not such a high demand for heating and hot water. With this model also being available in an 15kW it is able to suit nearly anyone's heating demand. With this boiler also featuring an 2-year warranty you can be sure you're getting boiler that is not going to let you down.